The 7 Wonders range places nature and exoticism at the heart of its formulas. A real invitation to travel! These masks are manufactured according a unique, exclusive process developed by Leaders : Coconut juice bio-fermentation. In nature and all corners of the world, LEADERS found plant and fruit extracts with strong cosmetic properties. On the program: a well-being excursion at home! CARIBBEANS DESTINATION: Immediate boarding for a sublimated tan! Enjoy the benefits of the sun and its anti-depressant effect on morale ? Yes! However, it is essential to protect the skin and repair it after sun exposure ! The Caribbean Coconut mask is THE indispensable survival kit to moisturize the skin and sublimate the tan. Formulated with coconut oil extracts, it refreshes and appeases the skin. It soothes irritations and the skin recovers its softness. Practical and efficient, it slips easily into your suitcase. A no-return ticket for a perfect tan. TUNDRA DESTINATION: Immediate boarding for a rejuvenated skin! An ounce of prevention is better than a pound of cure! To preserve the skin from ageing, it is crucial to act from a very young age. Removing make-up every night and keeping the skin hydrated are of course the basics that must not be overlooked. But you can also give your skin a helping hand! 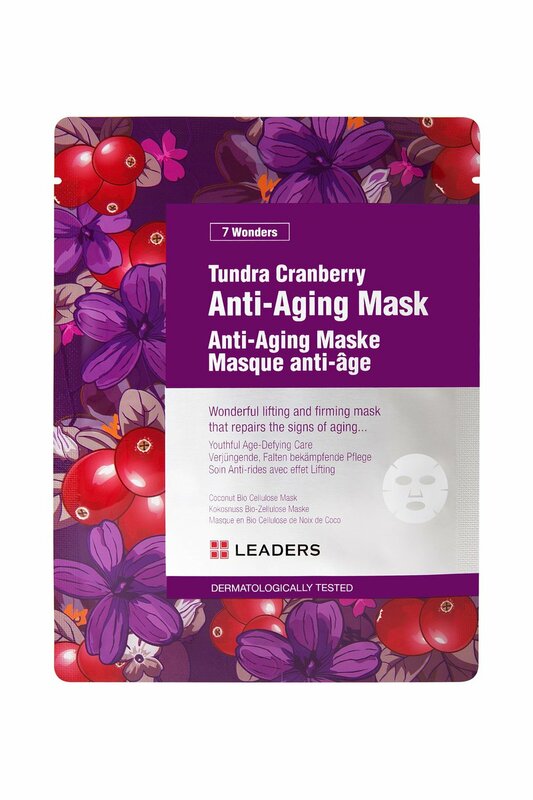 The Tundra Cranberry mask is the best solution to offer your skin a more youthful appearance. Formulated with cranberry oil, it purifies the skin by eliminating free radicals (which accelerate the skin-ageing process). Wrinkles and fine lines are reduced. A youthful hike for skins thirsting for youth! MEDITERRANNEE DESTINATION: Immediate boarding for a flawless skin! With excesses and hectic lifestyles, the skin often show signs of fatigue. The complexion looses its radiance and blemishes may appear. And, since we can’t just be on holidays all year round, a solution must be found! The Mediterranean Olive mask is the beauty essential for a radiant complexion. Thanks to its olive oil extracts, the skin is smooth and refined. Used since ancient times, olive oil is recognized for its revitalizing action. Full of essential fatty acids and vitamins, it protects the skin and participates to cell renewal. Let’s embark immediately for a flawless cruise! With the cold weather, all skin types – dry, combination or oily – is subject to aggression and responds to protect itself. The result? Redness may appear and give a sensation of tightness. With stress and pollution, the complexion becomes duller… SOS skin in distress! Keep calm ! The Oriental Camellia mask was specially developed for the most sensitive skins. Formulated with camellia oil, (recognized for years as the “miraculous oil” of Asia) it relieves and soothes the skin. Redness is reduced and the complexion restores its freshness and radiance. A well-being excursion in no time! KALAHARI DESTINATION: Immediate boarding for dry skins! Thankfully, the Kalahari Melon mask is THE ideal soft solution! Enriched in Kalahari Melon oil and Mallow flower extract, it helps to restore the skin’s suppleness and softness while bringing a genuine sensation of freshness. In a few minutes only, the skin is hydrated for a long time! Its more : based on vitamin C and E and hyaluronic acid, it provides anti-aging benefits. Wrinkles and fine lines are reduced and the complexion is more radiant. The beauty port of call for a vitamin-packed skin! TROPICS DESTINATION: Immediate boarding for dehydrated skins! The beauty secret number one? Hydration! Of course it is essential to drink 1,5L water per day, but there is more to do! The use of nourishing skincare is also crucial. The Tropical Andiroba mask is the ideal partner to help the skin recover its balance. It re-hydrates all skin types, even the most sensitive. It deeply nourished the skin and helps restore radiance to the complexion. Enriched in Andiroba seeds (a tree that grows in the tropical forests of Latin America), it is endowed with anti-inflammatory and soothing properties. The ideal itinerary for optimal moisture! AMAZONIA DESTINATION: Immediate boarding for dull skins! The Amazonian Acai mask protects the skin while bringing freshness. The skin is rehydrated and recovers its original suppleness. The invigorating benefits of Acai oil restore radiance in just a few minutes. A great escape in the Amazonian forest and a breath of fresh air from your bathroom!